After taking a relentless pounding for their reporting in their "Loose Nukes on Main Street" series, ABC News has erased the discussion forum associated with it from abcnews.com. 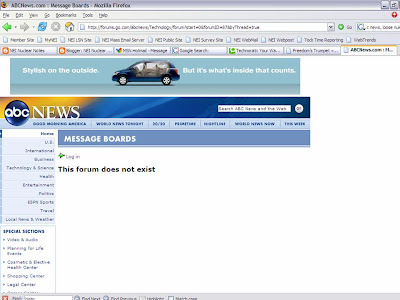 As of right now, a visit to the forum leads to a page that says: "This forum does not exist." It was just a week ago today that we reported that other readers in the forum were discovering that some of their posts were being erased. Looks like "free speech for me, but not for thee," is the news of the day. More later, as this develops. Thanks to Joseph Talnagi at Ohio State University for the heads up. UPDATE: I can also confirm that all of the messages that I posted to the "Loose Nukes" forum have been erased. However, I have started another discussion string in John Stossel's forum asking ABC News why they erased "Loose Nukes." Feel free to join in. ANOTHER UPDATE: I've also added another discussion string in the Primetime Live discussion board. Thanks to Ryan Meyer at the University of Missouri for the suggestion. Postings that have given all too effective a rebuttal of ABC's shoddy and irresponsible Loose Nukes stories are now being shoved down the Memory Hole. ABC's forum managers should be ashamed of themselves. Do you want to become the next CBS? I don't think they were expecting the research reactor community to challenge them so strongly. ABC probably isn't used to being challenged on their own turf, so they took their ball and went home. They were big and brave when they had the stage to themselves on the one hour prime time format, but when they started taking some flak, they pulled the plug. My guess is that they'll come up with some weak, lame excuse, like "our interns felt threatened by some of those responses". Well, if so, all I can say is, if you're gonna dish it out, you'd better have the guts to stand up and take your lumps. A valuable life lesson for the kids to learn. It would be sweet to have a posting of what ABC doesn't want seen. The MSM guys still think they control the game by closing down their distribution channels. Very silly. Perhaps I should clarify that comment a bit. I've created a thread at the Nuclear is Our Future discussion board about this. It will most certainly not be censored. Sorry if that sounded like spam. Why the Renewed Interest in Nuclear Energy? Another Strike Against the "No Solutions Gang"
MIT Nuclear Grad: ABC News Guilty of "Overhype"
ABC News Intern Update: Who's Zooming Who? NRO on ABC News Report: "Needlessly hysterical"
Getting In Touch With ABC News on "Loose Nukes"
Why Are We Following "Loose Nukes" ? What's The Real Cost of Overregulation?